Home / Cosmetics / TRANSINO Whitening Facial Mask - Not a fan of pills? TRANSINO Whitening Facial Mask - Not a fan of pills? If you are not a fan of swallowing pills like our Transino White C pills we talked about few days ago, this is your alternative. 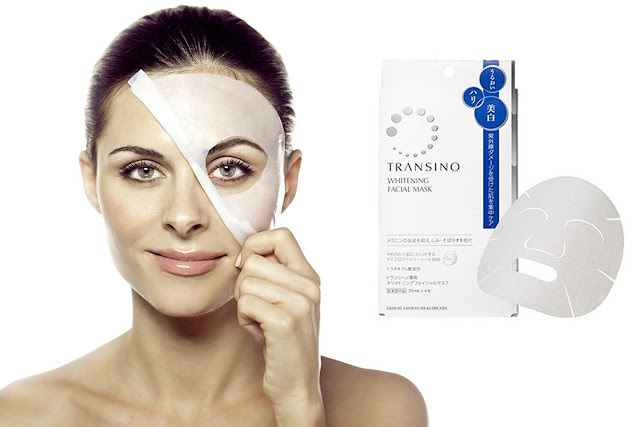 TRANSINO Whitening Facial Mask is a skin-brightening Japanese sheet mask that treats dark spots. The ultra soft, microfibre sheet mask is medicated with m-Tranememic acid to treat and prevent dark spots. It also features a blend of “KP complex” (white mulberry root extract and calcium pantetheine sulfonate) to brighten skin tone and Ceracute® to improve skin elasticity. Calcium pantetheine sulfonate: Believed to work as a skin lightener/brightener. While its lightening effects have yet to be fully substantiated, there is a small amount of research showing that it inhibits the production of melanin (Source: Pigment Cell Research, June 2000, pages 165–171). Several other studies also suggest that it can encourage hair growth and work as an anti-inflammatory on the skin. This ingredient is contained in cosmetic products such as facial moisturizer, anti-aging treatment, foundation, age-spot treatment, facial masks and sunscreen. White mulberry is a herb. The powdered leaves are most commonly used for medicine. The fruit can be used for food, either raw or cooked.White mulberry is often tried in order to help treat diabetes. It is also tried for treating high cholesterol levels, high blood pressure, the common cold and its symptoms, muscle and joint pain such as from arthritis, constipation, dizziness, ringing in the ears, hair loss, and premature graying.